Almost everyone has a deep-rooted fondness for cooking with cast iron. Whether it’s a secret family recipe passed from generation to generation or the aroma of bacon sizzling in a searing hot skillet, there are few matched kitchen items as endearing or enduring. 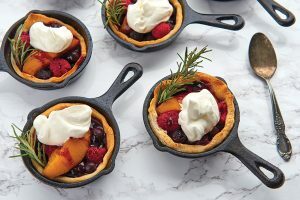 The simple act of seeing food being prepared in a gorgeous cast-iron skillet alerts the senses to the thoughtfully prepared meal that’s about to be shared by those you hold dear. A favorite personal memory looks back to Sunday brunch with friends who are as close as family. The ritual regularly perpetuates to this day and has grown to include many small children who now joyfully run around us. Vintage 15-inch skillets that have produced as many meals as a line cook over decades of use are literally at the center of every gathering. Creamed beef, fried potatoes, bacon and coffee cake are among the morning delights warming the soul and the time shared together. From period-correct civil war reenactments to the Food Network, the history of cast iron cookware is older than our nation. 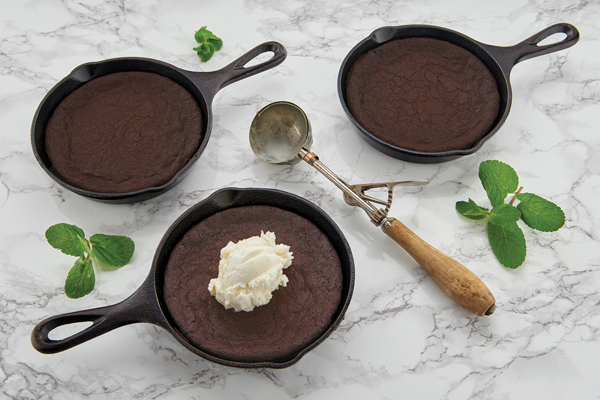 In a world filled with trendy, often-needless kitchen gadgets, cast iron remains a staple in the modern era. Today, cast-iron skillets have matured into functional heirloom pieces, gifted in a rite of passage from one generation to the next. Equal in tradition is the misguided devotion and folklore surrounding the use and care of cast iron. It becomes so “iron-clad” that many people outright refrain from using one of the best pieces of cookware in the kitchen. Cast-iron skillets are notoriously heavy; ideally, they should be picked up with both hands and not slid across a stove or countertops. Once heated, iron is superb at sustaining consistent temperatures due to its density. Where the temperature of a heat source may waiver, the heat energy stored in cast iron provides an even cook or bake, especially in an oven. Cast iron is ideal for searingly high temperatures and for frying, braising and baking. It can be used on any type of stovetop, grill and fire. It’s also perfect for oven use. Metal utensils are safe for bare cast iron but can cause enameled cast iron to chip. 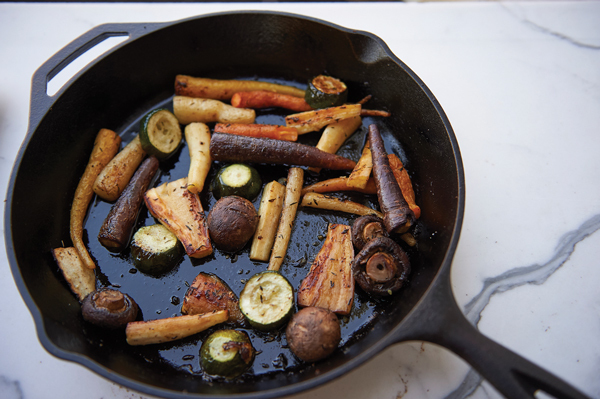 Overall, cast iron is one of the most versatile tools in the kitchen. Along with a quality chef’s knife, a saucepan and a stockpot, your essentials are covered. However, cast iron does not distribute heat that evenly on a stovetop regardless if you are heating with an electric or gas range (for that you’ll want copper). While quite good, cast-iron skillets are not the absolute best option for non-stick surfaces as many profess. Letting meats, fish, vegetables and other foods cook in a hot skillet until releasing from the pan requires a little patience. Food will let you know when it’s cooked on one side and ready to turn, but if you rush the process, food will stick and fall apart. I fully anticipate the following statement will be considered heretical, but cast iron stands up well to regular use, and the notion that soap is a deadly sin is an absolute fallacy. Caring for cast iron is simple and, short of cracking it or putting it in a dishwasher, you should be woefully commended if you actually destroy a piece of cast iron. Cast iron is durable – after all, it’s a hunk of bare iron – but it will rust if neglected. Rust can usually be removed with steel wool (or sandblasted in extreme cases). 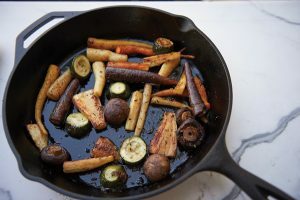 Cast iron can be hand-washed with soap and water as needed, using whatever abrasive you like, including a brillo pad, so keep the salt and potato for cooking your next meal. Here’s the critical bit: towel-dry your cast iron immediately after washing it, then heat it on a stovetop to ensure absolute dryness. After letting it cool for handling, apply a thin coat of your choice of cooking oil with a paper towel to the entire skillet, handle, bottom, and all. Some argue flaxseed oil is best, I often use recycled oil from making beignets simply because I have it on hand, but rust prevention is the ultimate goal. 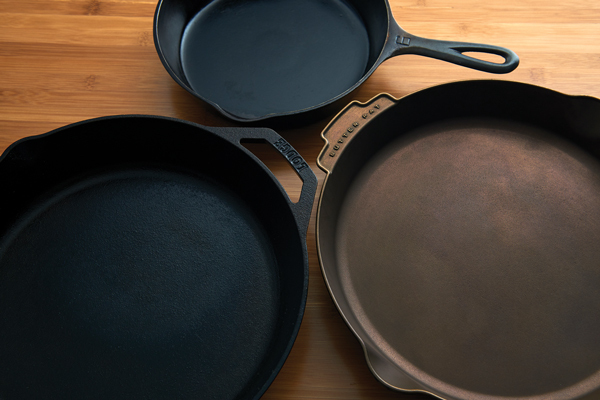 Frequent use will benefit your cast iron, as it will build up a thin layer of polymerized oil. Cast-iron seasoning is not as sacred as people make it out to be, to the extent that some chefs deglaze cast iron instead of leaving all of those rich flavors to waste on the pan. The smoother the cast iron, the less “seasoning” is required to fill in the bumps. 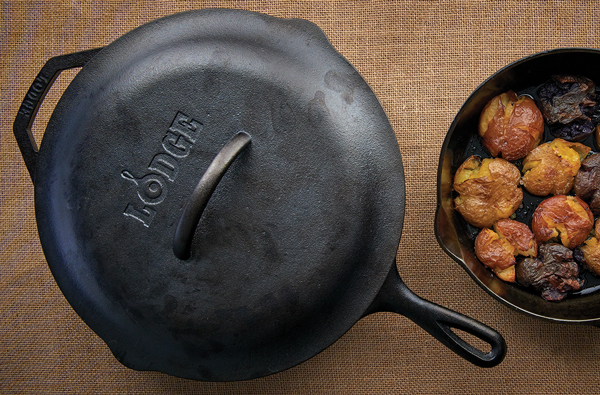 To that end, manufacturing cast iron is an art, and not all skillets are created equal. Our kitchen is home to an assortment of Griswold and Lodge skillets. Made decades ago in Erie, Griswold offers a delightful cooking experience. Lodge’s skillets, which are sand-cast in Tennessee, are quite affordable and readily available in many cooking and department stores. Due to their density, Lodge is ideal for holding heat, though their surface is slightly rougher compared to our antique Griswold skillets. My favorite Lodge skillets are 3.5 inches and 6.5 inches in size and are perfect for serving appetizers, sides and desserts. They fit nicely in our convection toaster oven. 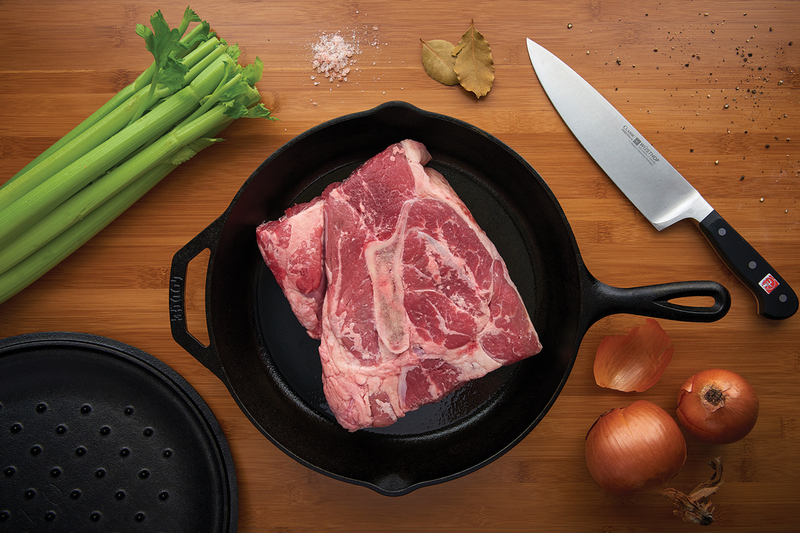 Guests swoon over the presentation of a skillet at dinner, yet they’re so simple to use. Fair warning: Make sure you have enough hot pads or thick kitchen towels for handling a hot skillet. Despite marketer’s best efforts, the old ways are often the best. To obtain an old skillet like a Griswold, Wagner or Erie, you may have to take your chances in an antique market such as Shupp’s Grove or Root’s. 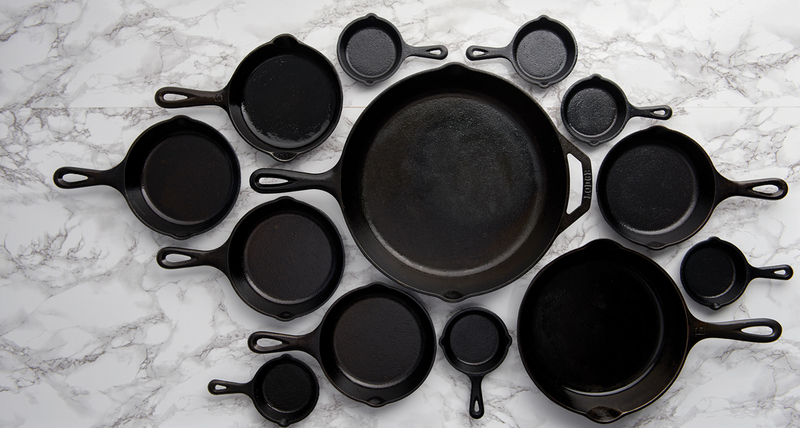 The collector market is strong so expect to pay a pretty penny for an old cast-iron skillet. I regularly dream of owning an old Griswold 15-inch skillet, Dutch oven, or cast-iron waffle maker. In searching to find someone who takes passing the cast-iron baton to an astonishing extreme, I met Dennis Powell. Some 40 years ago, when Dennis set out for college, his mother “unceremoniously” bestowed his grandmother’s skillet and butcher knife, both used in her profession as a butcher. After more than four decades in Dennis’ care, the skillet took a fatal fall one day and cracked, leading to a somber moment by the hearth as Dennis held the shattered pieces in his lap. Having two sons of his own, Dennis had planned to pass the skillet on to one of them. 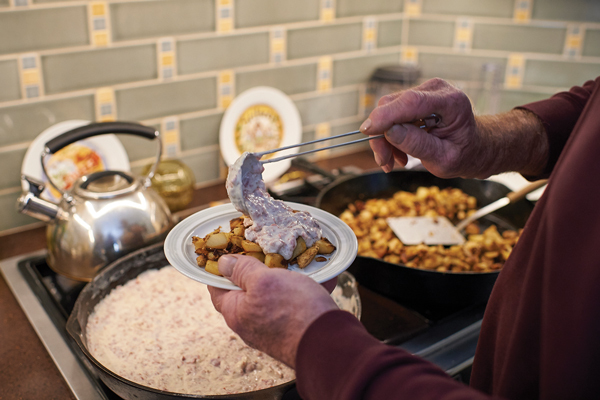 Unable to repair his grandmother’s skillet and determined to continue the family tradition of passing on cast-iron cookware, a personal mission took root: make two new cast-iron skillets. 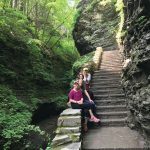 Paired with the curiosity of an architect and a deeply carried drive to continue the family tradition, Dennis visited 23 foundries, eventually partnering with one in Lebanon County. 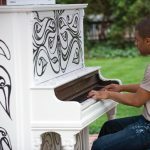 “They’ve been kind of old-fashioned technicians that we admire in figuring things out,” he says. Dennis wanted skillets that would match or exceed the quality of skillets from the early 1900s, which is no small feat. When casting safety regulations changed in 1955, pans suddenly became rough. “I looked at the advertising records of all the major manufacturers from the 1800s to the late 1955, and there is almost no mentioning of seasoning in the advertising,” Dennis explains. “There’s no mention of, ‘go home and don’t wash your pan.’ This is mythology based on fact, but the fact is it’s because your pan is rough.” Pressing forward, improving on an old Griswold recipe meant new technologies would have to be invented. In a lesson of perseverance, after 18 months without success, the last pan in the last batch of seven finally produced an intact casting. At that moment, Dennis’ personal mission led him to become the unintentional founder of Butter Pat Industries. 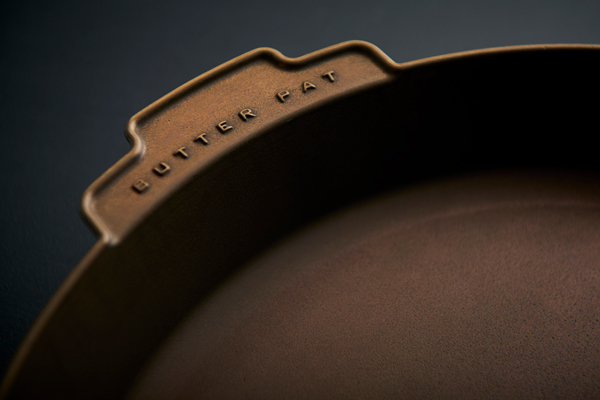 Their precise quality, thicker bottoms and thinner sides (as compared to those from the past) make Butter Pat’s skillets highly desirable. They are used daily by restaurateurs all over the world, including a personal favorite of mine, Sean Brock, owner of Husk in Charleston, South Carolina, where Dennis’ family is originally from. 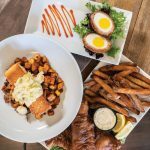 You can imagine the lack of wariness and obsessive care that busy restaurants give to their skillets, while rightfully expecting them to remain in service for many years. If you already have an old cast-iron skillet tucked away in a cupboard, it’s absolutely worthy of reinstating into service. While less common, adding a braising lid will provide remarkable value to an already beloved skillet, turning it into a slow cooker. A cast-iron lid produces radiant heat with low airspace; moisture condenses on its peak and drips down evenly on your food as it cooks. 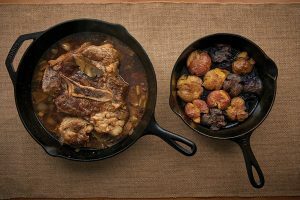 It’s perfect for braising and roasting tough meats in a manner quite similar to the Dutch oven, but that’s a conversation for another time. I ordered a lid for my 12-inch skillet, and it arrived just as a snowstorm approached. My desire to use it was met exuberantly (foolishly) – I braved the snow and headed to Farmersville Butcher Shop for a fresh, 3-pound, bone-in chuck roast. Needless to say, it did not disappoint. Braising a 3-pound chuck roast makes full use of the cast-iron skillet’s benefits, and the results are as impressive as the roast is straightforward. First, brown a bone-in chuck roast in a hot skillet. Remove the roast, add vegetables and cook until soft. Place the roast directly on top of the vegetables, cover with a braising lid, and set in a preheated oven for four hours of delightful aromatic punishment at 200 degrees. To accompany the roast, boil a medley of potatoes until soft before smashing then broiling for 30 minutes in the skillet from which they are served. 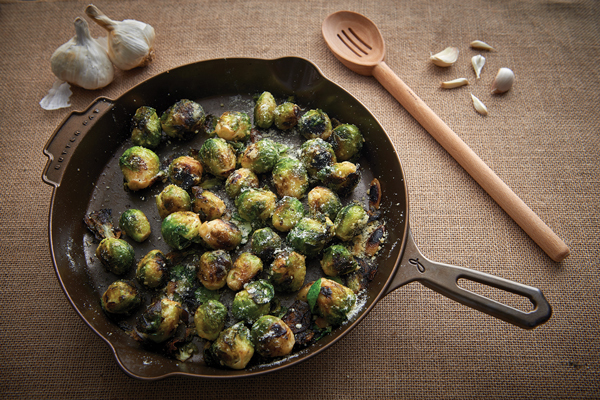 Brussels sprouts can be browned on the stovetop with garlic, olive oil, salt and pepper before roasting in the oven for 15 minutes, turning every five minutes. Whether or not you have children of your own or nieces, nephews or friends that are as close as family, starting a tradition of your own can be much simpler than casting your own skillets. A touching example comes from one Butter Pat patron who gifts a skillet for every newborn child in the family, lending it to parents until his or her 18th birthday. It’s a gesture that creates a legacy full of warm meals, togetherness and memories shared by all. Few items provide a joy and sentiment that branch far into your family tree, reaching those we may never get to meet. For a humble piece of cookware, the cast-iron skillet embodies the intangible but ever-essential ingredient in all of your recipes: love.